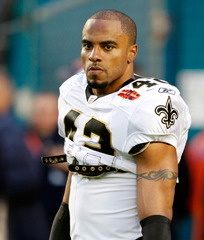 According to Brad Biggs of the National Football Post, veteran safety Darren Sharper remains consistent in what he has said all season-he wants to return to the Saints. The question is whether the Saints want him back. Sharper is 35 and his durability will be an issue with the Saints or any other franchise. He has been beset by knee problems and underwent microfracture surgery a year ago. If he doesn’t have a home in Gregg Williams’ defense, he wants to play somewhere for a 15th season in the NFL. He is tied for sixth all-time with 63 interceptions in his career-nine more than the closest active player, the Baltimore Ravens’ Ed Reed. Three more interceptions would put him at fifth all-time and would help his Hall-of-Fame candidacy. Sharper is in no hurry to qualify for the Hall-of-Fame. He wants to keep playing at least one more year and believes the current work stoppage is actually benefiting him. Younger players will not have the time to get up to speed with defenses, and that could make a veteran who can learn a system quickly more valuable. Plus he can work out at his own pace. Sharper has to face the fact that his time will be up soon. He just hopes he has not already played his last game in the NFL.